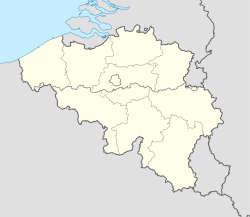 Rijkevorsel (Dutch pronunciation: [ˌrɛi̯kəˈvɔrsəl]) is a municipality located in the Belgian province of Antwerp. The municipality comprises the town of Rijkevorsel, Achtel, Sint-Jozef-Rijkevorsel and Gammel. In 2015, Rijkevorsel had a total population of 10.495. The total area is 46.79 km² which gives a population density of 224 inhabitants per km². Rijkevorsel, Vaishak, Voirssele, Forsela in 1194. Recent archaeological finds at the Willow Street attest to human presence in the late stone age, the bronze and iron age and the Roman times. A large cemetery with cremation (urnfield) on the Helhoekheide may point to a first settlement being present here already before the beginning of our era. This page was last edited on 13 January 2017, at 07:35 (UTC).